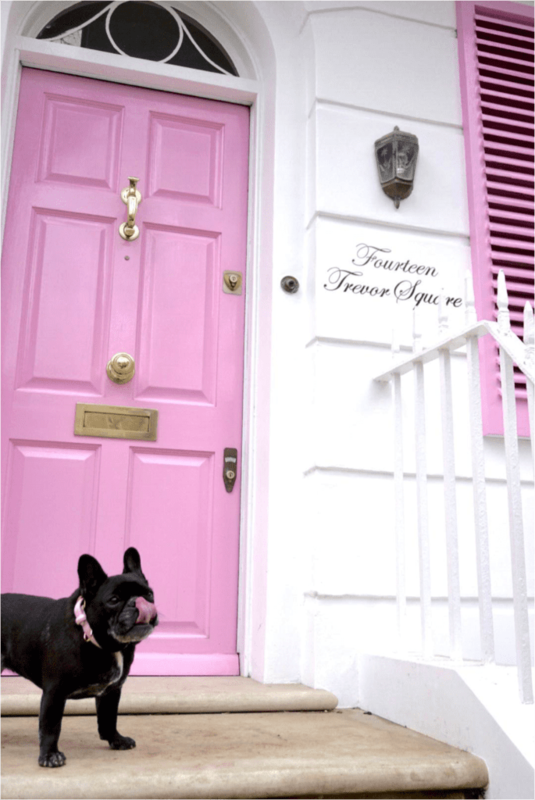 The Most Instagrammable Spots: London Pink Edition - Where's The Frenchie? You want to upgrade your Instagram game. No need to play, we see you commenting, liking and joining telegram pods but the quality of your posts don’t match. Brands don’t bat an eye at your account. It’s time to head to West London where Spring is always blooming. When in doubt, pink it out. Use a pink color accent, wall, chair, restaurant or piece of clothing. 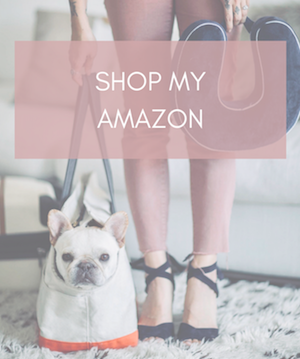 Nothing says lifestyle blogger like pink. Here are some of our favorite pink doors to get into your feed. Located two blocks from the basic heaven, Harrod’s. Locals say Harrod’s photos are only okay if you are not from England. If you are a local, the famed store has all the cache of taking a photo with a model at Abercrombie & Fitch at the mall. One word of advice if you do go into Harrod’s: avoid the loo with the perfume unless you like choking on it. Get yourself to The Pink House. There’s a little plaque to let you know you’ve made it to the right spot. Pink Parfait Perfection. The googley-eyed house is epic for the kid in all of us. 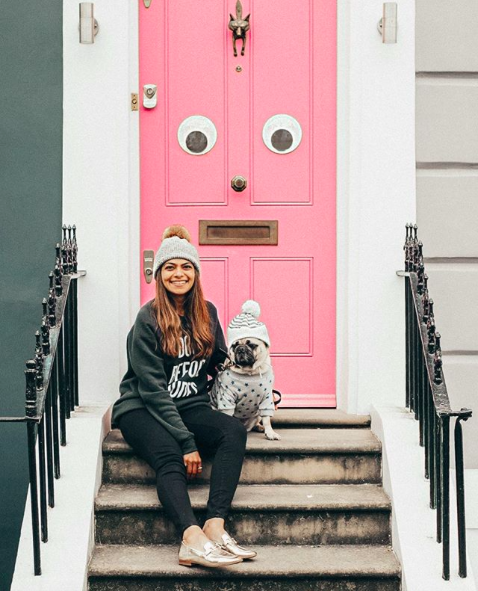 Try incorporating a color twist and a geniune smile, like @honeyidressedthepug aka Ari & M.
Make it your own by checking it out with a friend like Ari & M. Look how M’s jumper matches the house on the left–playing with the non-obvious color is a skill. Pure joy and love is never basic. The bond of these two evokes a smile from the viewer. 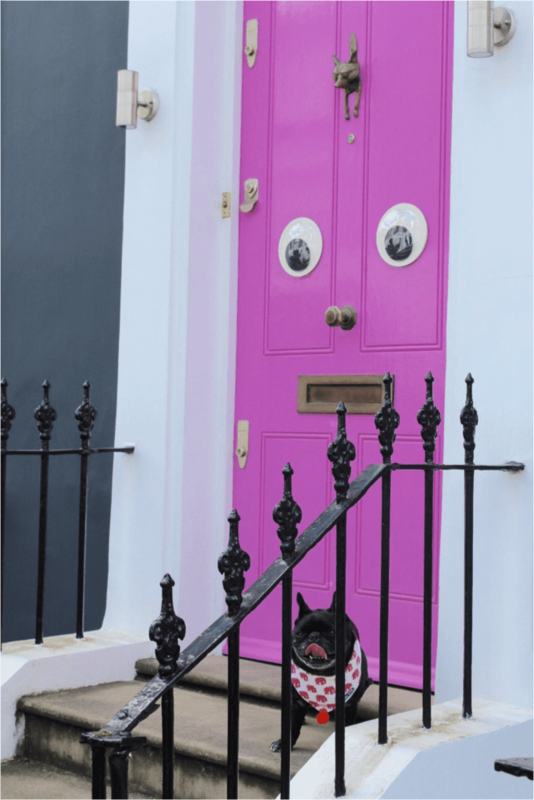 Be warned, this pink door is the gateway drug to colourful doors in Notting Hill! 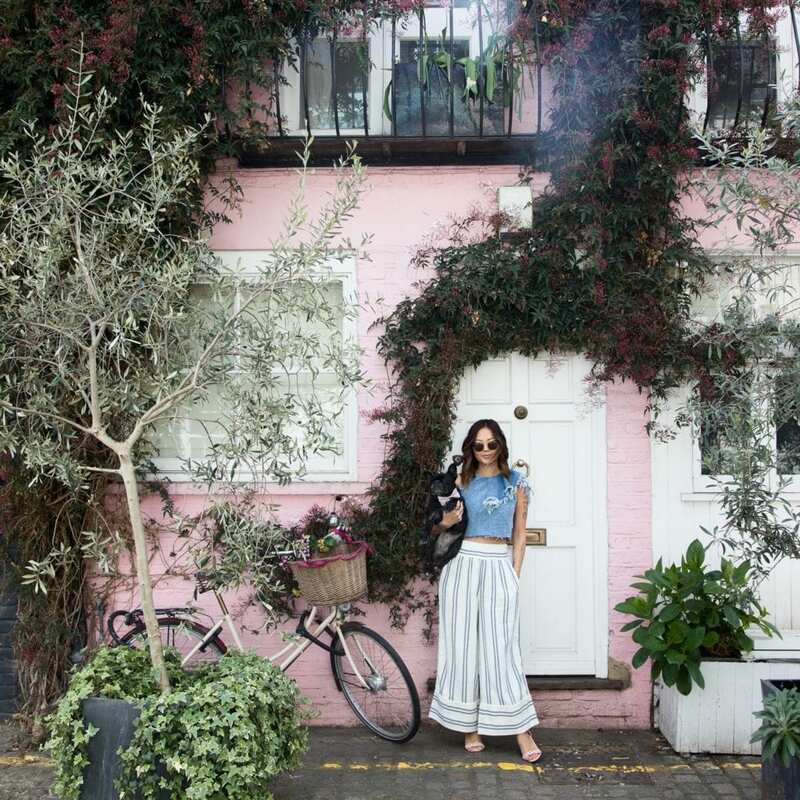 Make your way further east to colorful Portobello Road. While some residents have been known to huff and puff, most embrace the delight of visitors. Be respectful, if a gate isn’t open, don’t open it to stand in front of a door. If a resident comes in or out and requests you move along, please don’t give them a hard time. It’s not cute, bish. Keep it moving instead for an action shot like Nikki and Elle. The queue goes quickly but get there early or do during the week if you have that luxury. What are we saying? You are a go-getter Grammer so you will make the time to get the shot. Food gone cold? That’s the Gram. Alright, I’ll stop teasing you and tell you the food is fresh and delicious at Farm Girl. 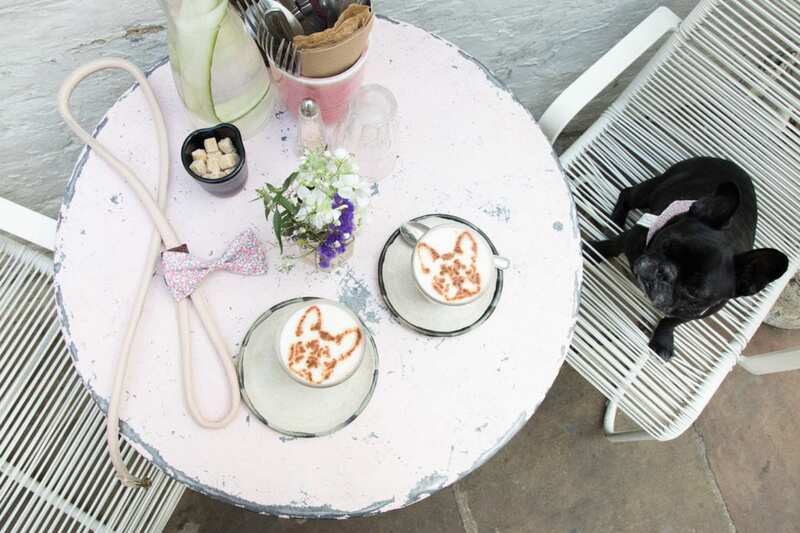 The tables outside are a beautiful pink–all the better to showcase the best latte art. 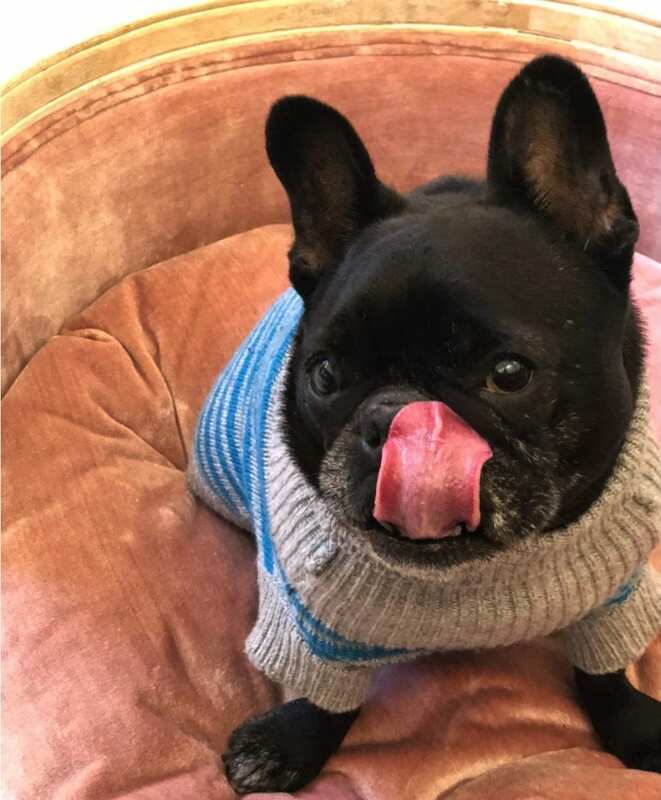 If you are a Frenchie parent, you must order either the chai tea or turmeric lattes, which come with Frenchie coffee art. Hashtag dog-friendly! No need to leave your precious babe behind in London. 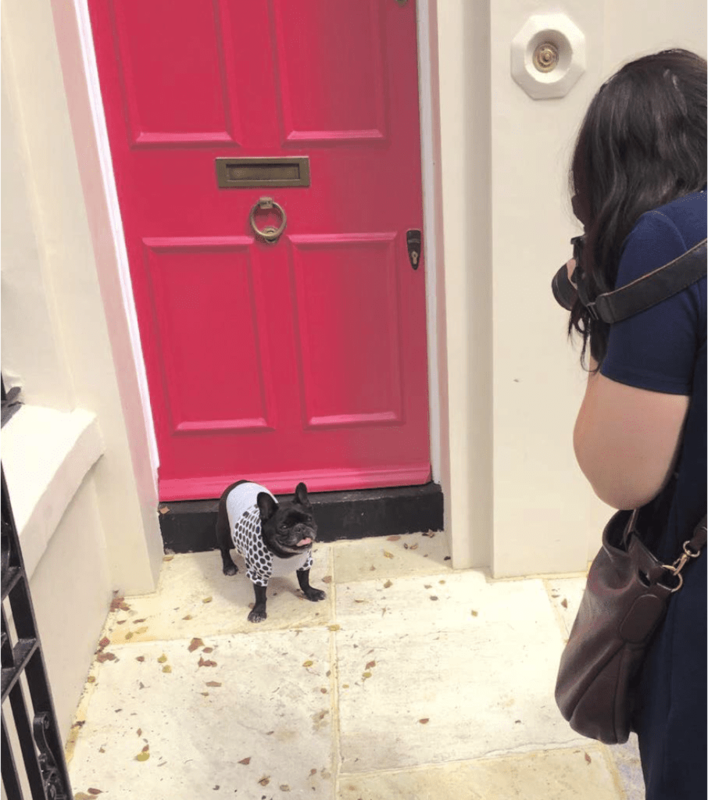 Now that you’ve filled your belly with pancakes, make a left down Portobello, but don’t stop for the main crowded streets–you’re on an IG mission. Head a few blocks south and you will be rewarded with St. Stephen’s Mews. The mews were historically where the royal hawks were kept, not horse stables, while they moulted. I have to have learned a few random tidbits while living in London for three years. Photography Hint: if you have a dark colored dog, that pop of pink will actually identify that little nugget. Easy up on the shadows and add more exposure in Light Room to get more details on a dark dog. 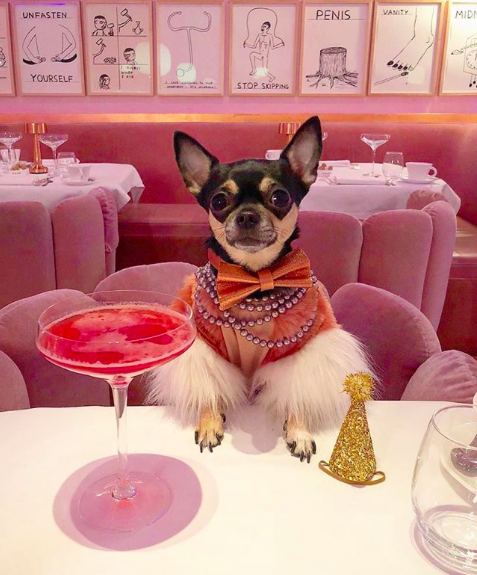 I saw Sketch London three years ago on designer Christian Siriano’s Instagram feed–hey, you basics can’t skip this one. 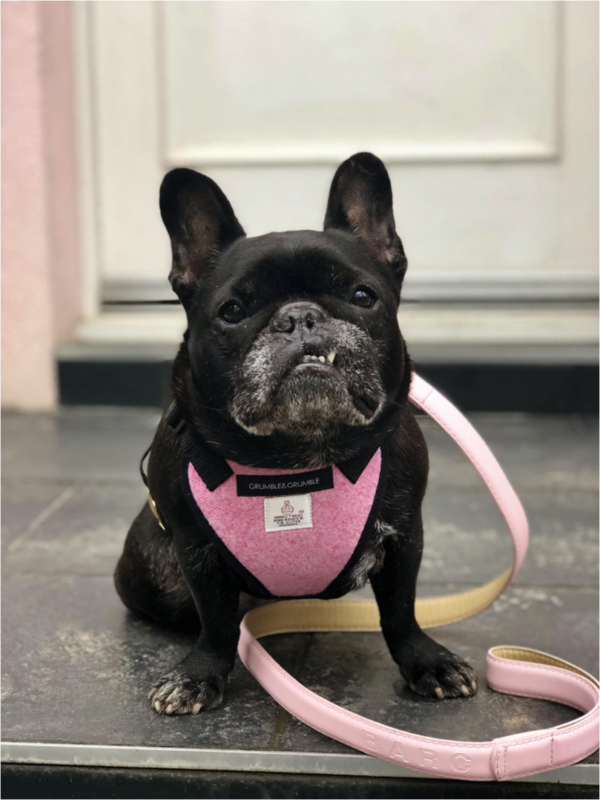 The pink perfection that is the Gallery is reserved for VIP Pooches like @dolly_pawton. Small, well behaved dogs are allowed in the front Parlour from 7 am (for the Advanced Level) to 4 pm during the week. Enjoy hella sweets and feel like a VIP by the staff. No matter where you get seated, you will slay at Sketch. 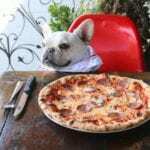 Be sure to ring ahead to double check as the dog policy has changed twice since I’ve been going there. 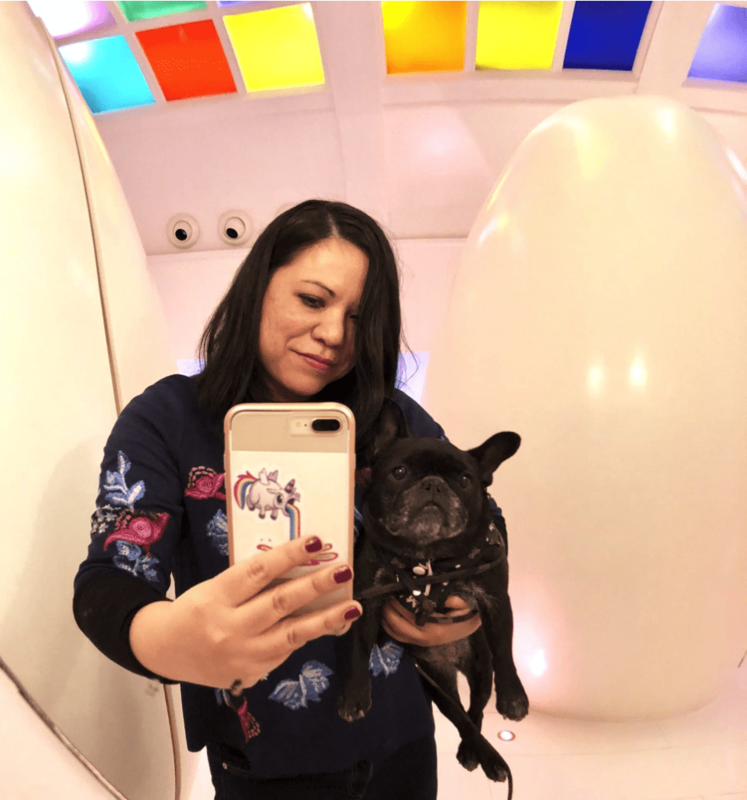 Bathroom Selfie at Sketch is Instagold. 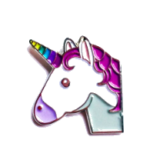 How dare you think Unicorn Lattes were too basic! Slow that roll, you’re getting a little cocky there, basic bishes. 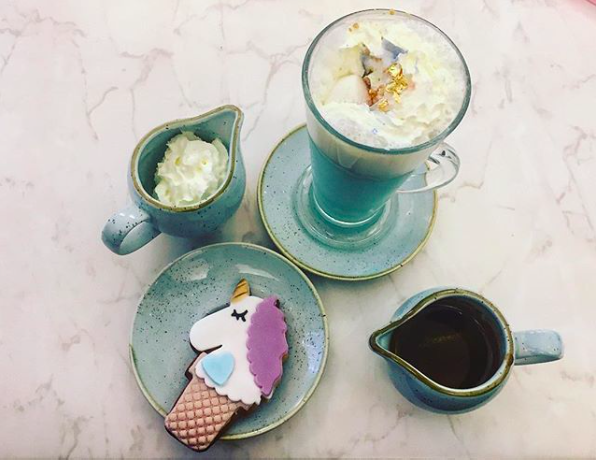 London’s newest twist on the unicorn latte gives you an excuse to have another pink drink we know you are secretly addicted to and we are here to enable. 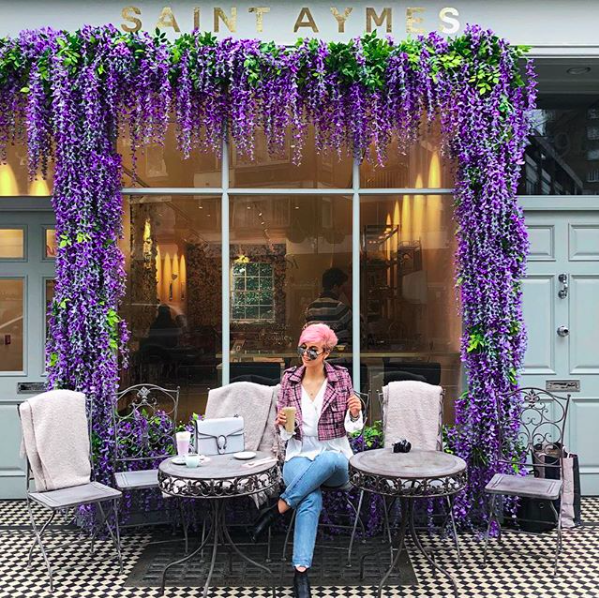 Head to Marble Arch, home of the self-proclaimed “most Instagrammable café” in London: Saint Aymes Chocolate. Inside-out, this café was designed with you in mind. Take a fresh memory card and your credit card because those pink drinks sprinkled in gold are upwards of seven pounds. 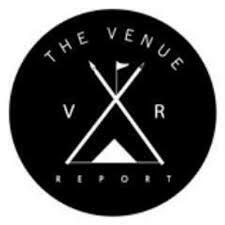 Marshmellows in the drinks, unicorn cookies and rose-covered interior walls next to green velvet seating, confirm it’s worth a visit. Get yourself a bar of Marie Antoinette perfect pink confection as another prop. Take it to go, because your pink pop will be handy and you don’t want to go into sugar shock. 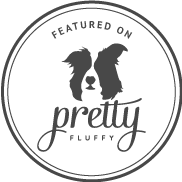 Get your outfits picked out in advanced because the dusty rose princess dog bed, is one your sweet furbabe will shine in, which is a massive bonus if you are unable to decorate your home to an IG worthy level. 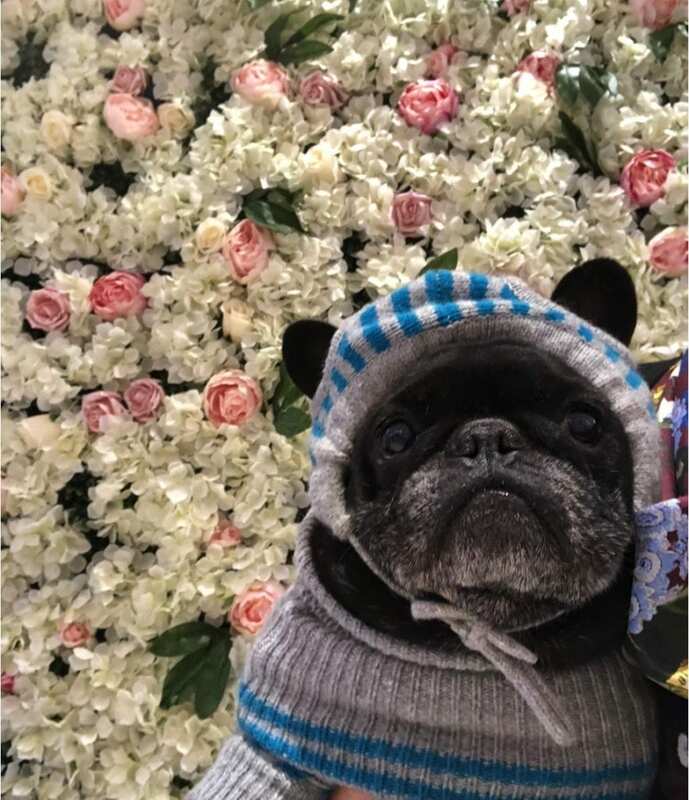 While Elan, the flower wall gold medal winner in South Ken has a queue down the street, it’s not dog-friendly. Who needs them? 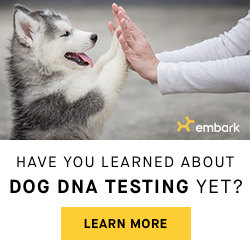 If your pup can’t go, why bother? Leave that for the super basic humanoids. 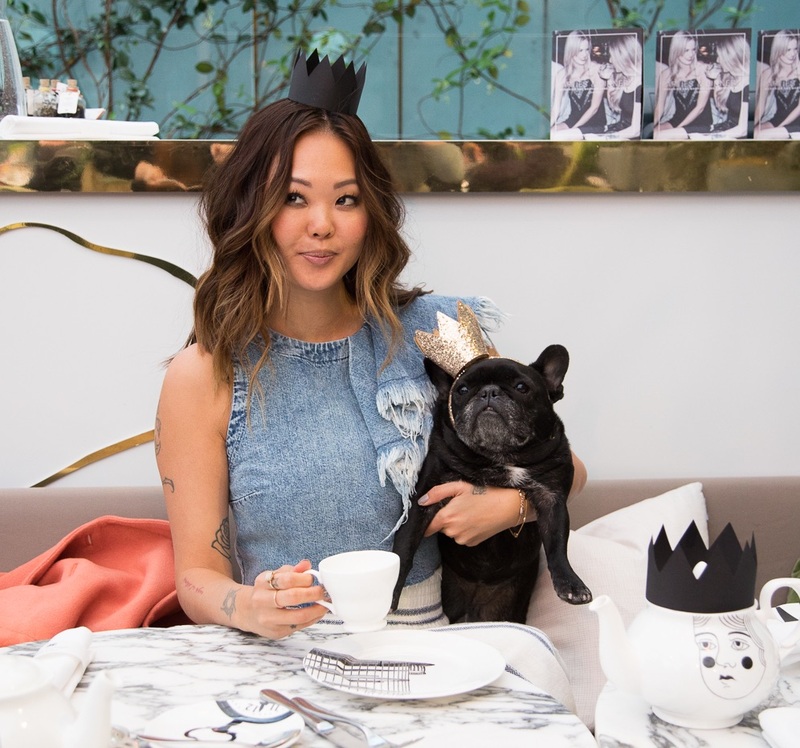 Instead enjoy Saint Aymes who even provide that perfect dusty dog bed to make your pooch feel like a star and that unicorn latte. We think we’ve given you enough of the basics to get your feed to a pink glow. Now fly little pooches, the advanced level isn’t for beginners. Swish swish, bish.